After hearing the scriptures from the "Gospel according to Matthew", Chief Yonaguska replied, "It is a strange that the white people are not any better after having this so long." Yonaguska, interpreted as "Drowning Bear," was born about 1759, some 40 years after English traders introduced the “black drink,” or rum, to his people in the North Carolina mountains. He is described as strikingly handsome, strongly built, standing 6 feet 3 inches, with a faint tinge of red—due to a slight strain of white blood on his father’s side—relieving the brown of his cheek. Like many dedicated reformers, Yonaguska’s resolve was strengthened by first-hand experience—he had been addicted to alcohol most of his life. When he was 60 years old and critically ill, Yonaguska fell into a trance. Certain that the end had come, his people gathered around him at the Soco Council House and mourned him for dead. In the council house was his adopted son William Holland Thomas, a 14-year-old white boy who was destined to succeed him as chief and become the only white man to serve as chief of the tribe. Drowning Bear referred to Will Thomas as Wil-Usdi or "Little Will." Will learned the Cherokee customs as well as how to write in Cherokee. He also learned their legends, history, and culture. Furthermore, at the age of 16, Will opened his first business (store) and perfected his organizational, leadership, and managerial skills. With a volume of law books, Thomas also became a self-taught and persuasive lawyer; acquired knowledge that would prove critical to the Cherokees' survival. In approximately 24 hours, however, Yonaguska awakened. When the chief addressed his people, he relayed a message from the spirit world: “The Cherokee must never again drink whiskey. 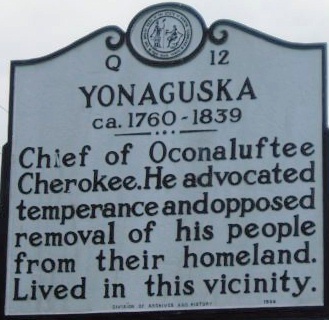 Whiskey must be banished.” He then had Will Thomas write out a pledge: “The undersigned Cherokees, belonging to the town of Qualla,” it read, “agree to abandon the use of spirituous liquors.” Yonaguska then signed it, followed by the entire council and town. Preserved among Thomas’ papers, the pledge is now in the archives of the Mountain Heritage Center at Western Carolina University. From the signing of the pledge until his death in 1839 at the age of 80, whiskey was almost unknown among the Cherokees. And when any of his people broke the pledge—few did while he was alive—Yonaguska enforced the edict with the whipping post and lash. Today’s Eastern Band of Cherokee Indians are direct descendants of the Cherokee Indians who avoided, or survived, the Indian Removal Act and Trail of Tears. After the removal of all but a handful of mountain Cherokee to the West, Yonaguska gathered those left about him and settled at Soco Creek on lands purchased for them by his adopted son, William H. Thomas. As a white man, Thomas could legally hold a deed to the lands and allow the Cherokee to live on them. Shortly before his death in April 1839, Yonaguska had himself carried into the townhouse at Soco, where, sitting upon a couch, he proclaimed his words to his people. The old man commended Thomas to them as their chief and again warned them against ever leaving their own country. Then wrapping his blanket around him, he quietly lay back and died. Yonaguska, the most prominent chief ever of the Eastern Band, was buried beside Soco Creek, about a mile below the old Macedonia mission, with a crude mound of stones to mark the spot. Recommended Reading: Famous Indian Chiefs: Their Battles, Treaties, Sieges And Struggles With The Whites For The Possession Of America (Hardcover) (516 pages). Description: This comprehensive book, regarding famous Native American Indian Chiefs, is drawn from the chiefs' own words from rare manuscripts, diaries, treaties, Bureau of Indian Affairs, special collections, national archives, and repositories, and it vividly portrays the chiefs' struggles, thoughts and views. There are two sides to every story and this is their story - the untold story and it has finally been explored and portrayed with this scholarly research. I highly recommend it!